Other great hotels I stayed at were Beachcomber Seychelles Sainte-Anne Island, Raffles Seychelles Praslin Island and Le Meridien Fisherman’s Cove where I posted postcards in an underwater mailbox (!) for some of my lucky Twitter and Instagram Stories followers. I flew non-stop between Paris and Mahe with Air Seychelles, an Etihad Airways partner. You can earn and redeem Etihad Guest miles with Air Seychelles. For my trip to the Maldives in November, I redeemed British Airways avios to book a one-way BRU-DOH-MLE on Qatar Airways Business Class. I stayed 3 nights at Conrad Maldives Rangali Island using 285.000 Hilton HHonors points. My first two nights, I was upgraded to a Water Villa which didn’t impress me much. The ‘dividers’ between the villa’s interrupting the views bothered me. For my last night, I moved to one of the newly refurbished Beach Villa’s which you normally get when booking with points. I liked those a lot more than the basic overwater villa’s! In the morning, I enjoyed complimentary breakfast at Vilu restaurant thanks to my Hilton HHonors Diamond status. Conrad Maldives offers unique underwater dining experiences in their Undersea restaurant Ithaa. I had the Champagne cocktail experience, the more affordable option to visit this amazing restaurant. On my way back to Belgium, I made a detour via Colombo and Kuala Lumpur. Tuk Tuk Safari Sri Lanka emerged me in Colombo’s food scene in their colorful Tuk Tuks. In Kuala Lumpur, Belgian balloon pilot Jonas hosted me for a thrilling balloon adventure above Putrajaya! My detour via Colombo and Kuala Lumpur had a reason: flying Emirates A380 Business Class extremely cheap… I paid less than 330 EUR! Bandaranaike International Airport (CMB) is one of “the four Cs” (Cairo, Cape Town, Casablanca and Colombo) which regularly offer amazing premium airfares. As if flying Qatar Airways B787 and Emirates A380 Business Class in one trip wasn’t enough yet, I had also added Etihad A380 First Class to my journey. I flew Etihad’s First Class Apartment from Abu Dhabi to London using 41812 Etihad Guest miles + 528AED (132EUR) cash. Similar to earlier in the year, I kept traveling every weekend in between my longer trips. In September I flew to Vienna where I made the short bus ride to Bratislava, my first visit to Slovakia. The second weekend of September was a family trip to Budapest where I stayed at the InterContinental with view on the Chain Bridge. I also had the pleasure to drive a number of Jaguars in the Fall of 2016. I made two trips to Reims & Paris with the Jaguar XE and Jaguar XJ. Dutch travel agency srprs.me surprised me with a weekend trip to Belgrade (Serbia). BMW made my ride to Dusseldorf a lot more exciting by borrowing me the 2016 BMW 330e plug-in hybrid. Hyatt Regency Dusseldorf hosted me in their Presidential Suite in November! December started with two sunny weekends in Cannes (France) and Valencia (Spain). Followed by a foggy pre-Christmas weekend in The City. All of the above makes 48 trips and 27 countries visited! Well, I have one more trip coming up this year, so the numbers above aren’t final yet! 😉 Make sure to follow me into 2017 via Instagram Stories, Twitter and Facebook. Enjoy the Holiday Season and as always, thank you for your support! Great work and stylish travelling. Thanks for all the tips and we must have missed eachother at the beachcomber Seychelles resort by one week i guess. @Bart – keep it up. Love the Insta stories…hope to run into you on the road one day. Those are some beautiful photos, very nice! But it’s bittersweet to me: with so many flights and car trips, your contribution to global warming is immense. Are you doing something to compensate? 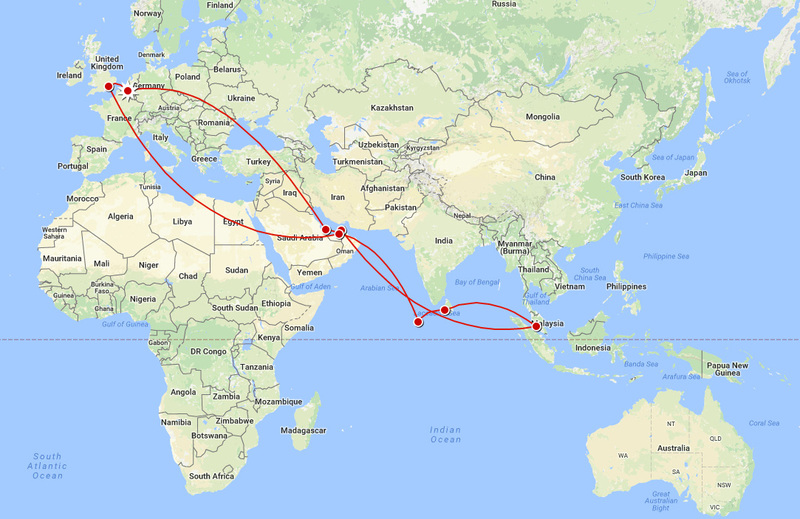 Mind sharing the routing of your 330EUR Emirates J fare? AFAIK they don’t have flights from CMB to KUL. Really interested in EK J! heb problemen met welke gespaarde ‘miles’ je kan gebruiken bij welke maatschappij. vb Qatar is one world maar kan je ze ook bij Etihad of Emiraten gebruiken? Het is en blijft chinees!!! Weet ook niet waar je de verschillende linken kan vinden? Wie kan je met Etihad linken, en wie met Emiraten? Hi Christl, there are three main airline alliances. OneWorld, Star Alliance and SkyTeam. In general, you can earn and redeem miles with all airlines within an alliance. Just make sure to credit all your miles in that alliance to ONE frequent flyer program, you can’t combine miles from different frequent flyer accounts. There are airlines like Etihad and Emirates which are not a member of these three big alliances. However, they have build their own network of partner airlines with which you can earn and redeem miles. You’ll need to check the airline’s website to see what their partners are. e.g. with Etihad Guest (Etihad’s frequent flyer program) you can earn miles with http://www.etihadguest.com/en/earn-miles/airline/ and redeem miles for http://www.etihadguest.com/en/spend-miles/airline-partners/ I know, it’s not that easy, but if you invest some time in it, you can get great rewards out of it! Dank je bart voor de nuttige info. Het is en het zal waarschijnlijk chinees blijven. (Ben niet van de meer jongste!!!!). Dank voor de link met etihad. Zou je aub ook de linken voor qatar kunnen doorsturen heb bijna 30.000 miles op account). De one world link zoals vb air canada zie je direkt op hun site, maar de extra airlines kan ik niet terug vinden. Nog veel genot bij je volgende reizen. kwou dat ik deze wereld vroeger ontdekt had!!!!!!!!! Dank voor alles,bart. En nog veel plezier in de lucht!!!!! !